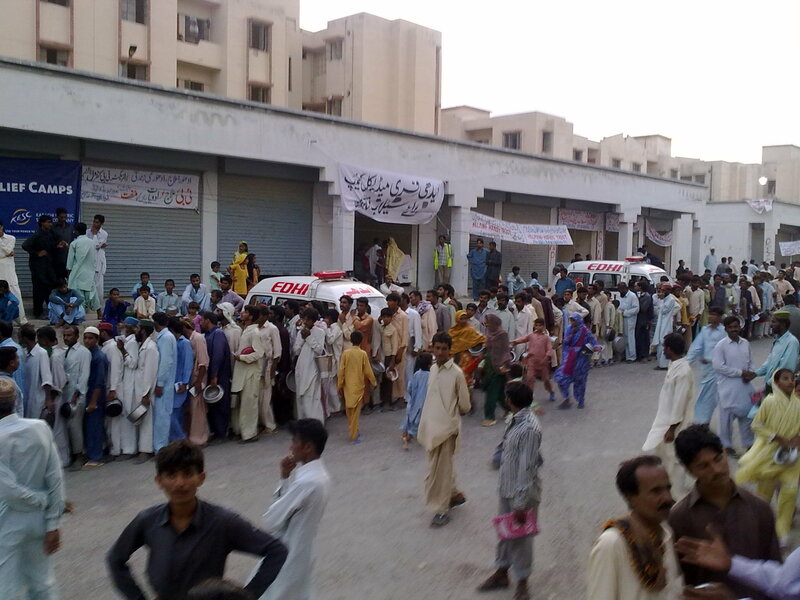 A C-130 from Jacobabad airlifted a group of stranded people to Karachi. These people are in a number of camps I visited in the Hawkesbay / Keamari / Manghopir area. One has 650 tents, and is generally secure and well catered for. The area has electricity and a tent hospital with beds. Another camp close by is in a girls’ college on the main Hawkesbay Rd. The college was built by PPP government 15 years ago. It never opened or finished, but still gets additions. 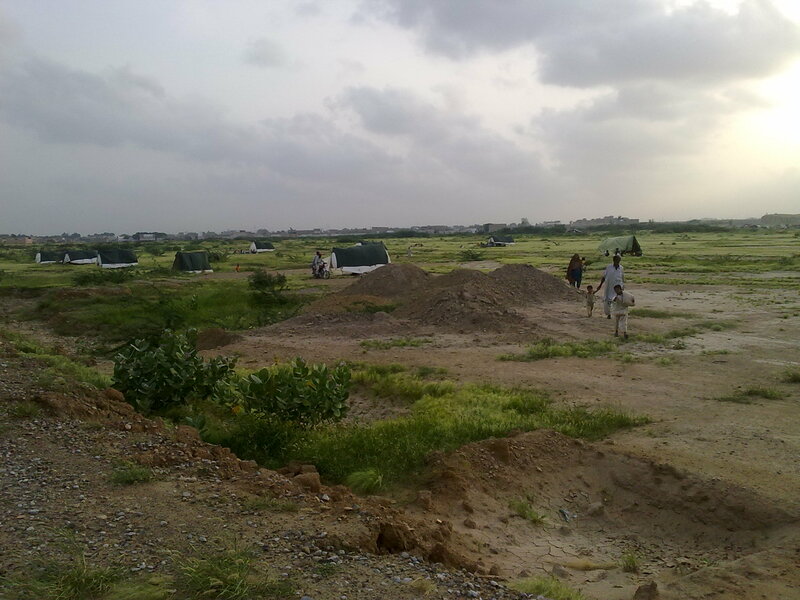 The refugees from upper Sindh housed here are being well looked after, but say they were never told that they were being taken to Karachi, or Mangopir. Ambulances and police are on standby, and district officers are on duty. There was an anti-mosquito spray at the college, which had a generator on standby, but no electricity. Face of despair. 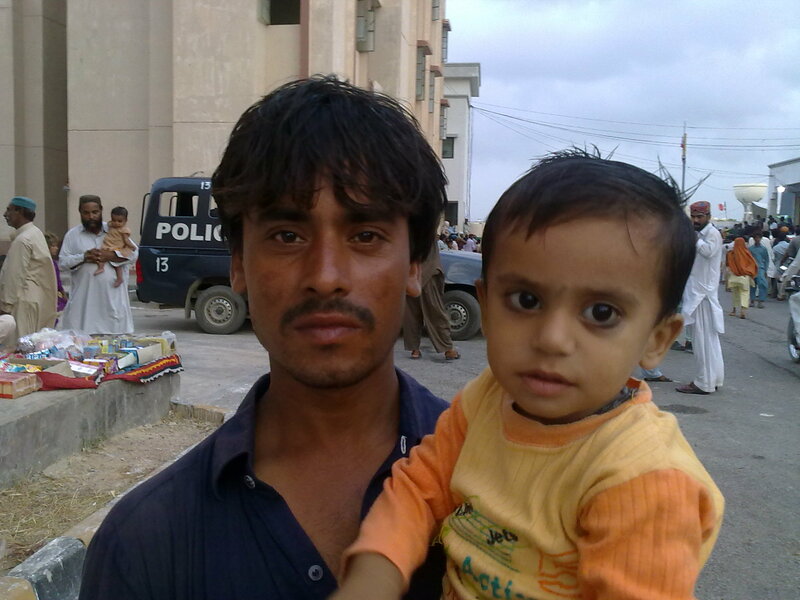 An IDP in Karachi. At least they were in a secure place and receiving meals, unlike many others under the sky on roadsides. I wonder if they will be airlifted back to the Jacobabad area, from where the Americans fly their drones, something the Pakistani politicians find it easy to lie about and deny. I also visited camps at the other end of Karachi. One was near Gulshan e Maymar in government flats, with long lines for food, with several police vehicles and more than one clinic. People had even set up stalls selling stuff, making tea, iftari and so on. Many fights are likely as this compound is severely overcrowded and people are generally unruly and from what I hear, from an area where karo kari (murder for ‘honour’) and serious petty disputes are common. Another camp is off the Northern Bypass, exactly near the Afghan/Pathan settlement near six huge grain silos. This is a smaller camp with perhaps 100 tents that are still being put up. I counted 40 already up. These are people who managed to get rides, or paid to get somewhere around here and were helped by volunteers to come to this camp. It has a water supply. The camp is a green pasture because of the rains and looks idyllic in the rolling hills all around. When the camp was set up a few days ago, families were fighting each other over tents, bamboos and other stuff. Now after a few nights’ rest, they seem to be helping each other. This camp unlike the others is not government run, or well catered for, although volunteers are collecting help and arranging for doctors and medicines. Then there are those people who are under the open sky, on the side of the Super Highway, without any security or volunteers to manage services for them, or even getting permissions for where they are camped. Some people had set up a few tents, not enough. 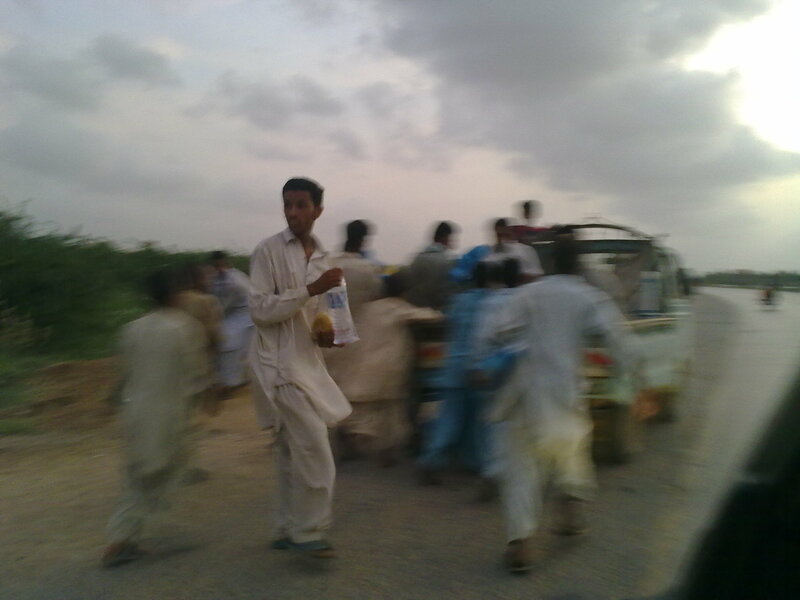 Two pick-ups were handing out biryani (rice with meat) and water to children and other folks running behind them. The numbers of such flood refugees in Karachi is still relatively small, although the number of people who have moved in with relatives in Karachi is estimated to be 700,000. Most of the people want to go back to their land and homes.